The reverse side revealing the hearts and diamonds pattern. A very large oval shaped earthenware drainer printed in blue with the Lady with Parasol pattern. The pattern is repeated on each side of the center. Added to the pattern are two carnation sprays and groups of birds in flight along with clouds filling the large surface. The border is a variation of the Butterfly pattern. 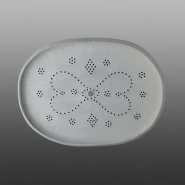 The drainer is punched in a hearts and diamonds pattern known on Swansea pieces suggesting a possible attribution to the Cambrian Pottery, Swansea. See below.